Come enjoy a fun and rewarding experience in our open and relaxed walk-in studio! Personalize your piece any way you like using our idea books, stamps, sponges, and more. The staff at Pottery Bayou is available to answer your questions and assist while you create your masterpiece. Fired pottery is usually ready for pick up one week from the date you painted. Choose from a wide variety of bisque items (ranging from $2 to $60). In addition to the price of the piece, there is an $8 Studio Fee for adults, $5 for 12 and under, and $6 for a group of six or more adults. The studio fee covers the cost of the paints, glaze, and firing process for up to four pieces. Pottery to Go is the perfect option for those who can't get out, are having a sleep-over, or just want to paint leisurely. You pay for the piece, Studio Fees for all who are painting, and a $25 deposit*, which will be refunded when everything is returned. Pick out your piece, paints, and any accessories you need. Once returned, your piece will be fired and ready for pick up one week from the date returned! Don't have time to paint? 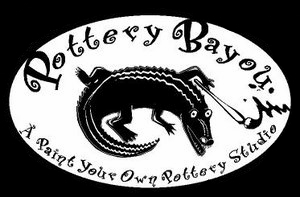 Pottery Bayou offers custom artwork for the price of the piece you choose, an $8 studio fee, and a custom art fee which will range from $5 to $20, depending on the intricacy of your design!